01:04 JEFFREY SEIF HERE WITH ZOLA LEVITT PRESENTS. 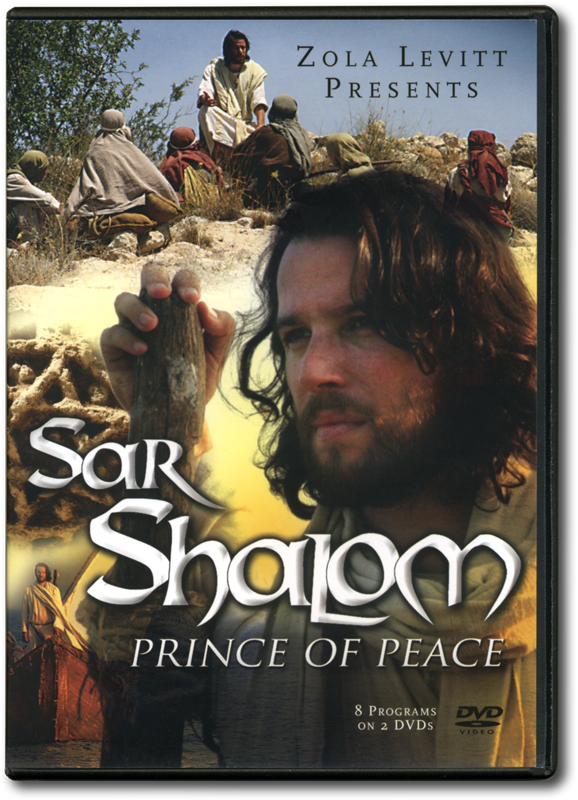 01:11 OF "SAR SHALOM - PRINCE OF PEACE". 01:14 AND GOODNESS KNOWS WE NEED MORE OF IT. 01:21 IS FEAR AND FRETTING. 01:27 AND THERE'S A VICTORY FOR US. 01:28 LET'S HEAR JESUS ON THAT NOW AND MORE. 01:53 "KNOCK AND IT WILL BE OPENED", SAYS THE LORD. 01:58 "SEEK AND YOU WILL FIND." 02:01 IT SEEMS SHE HAS THE SEEKING PART JUST FINE. 02:12 STILL UNABLE TO FIND AN ENTRANCE. 02:15 COULD IT BE SHE HAS OVERLOOKED ONE ADMONITION? 02:19 SIMPLY... KNOCK AND IT WILL BE OPENED. 02:32 A LITTLE RESTLESS PERHAPS? 02:52 TROUBLES LIKE YOU WOULDN'T BELIEVE! 02:58 THAT I'M COMING TO YOU FROM BETHSAIDA IN THE GALILEE. 03:06 MEANING "THE HOUSE OF FISH". 03:14 AND OTHER OF JESUS' DISCIPLES. 03:34 SOMEONE GOING HOUSE TO HOUSE LOOKING FOR A NEED. 03:42 AND SEE THIS FAMOUS STORY AND HOW IT MIGHT APPLY TO US TODAY. 03:51 BUT LOOK WITH ME HERE PLEASE IN MATTHEW CHAPTER 7, VERSE 7. 03:59 WILL BECOME APPARENT IN A MOMENT. 04:01 JESUS SAYS "ASK AND IT WILL BE GIVEN TO YOU". 04:05 YOU GO "YEAH, THAT'S WHAT I WANT...GOD TO GIVE IT TO ME." 04:10 HE SAYS "SEEK AND YOU WILL FIND". 04:13 "YEAH, THERE YOU GO GOD...YEAH HOOK ME UP." 04:16 "KNOCK AND IT WILL BE OPENED TO YOU." 04:20 SOUNDS GOOD DOESN'T IT? 04:25 AND HE'S LIKE THE PIZZA DELIVERY MAN, HE'LL GET IT TO YOU QUICK. 04:29 IN VERSE 8, "FOR EVERYONE WHO ASKS RECEIVES"
04:33 "AND HE WHO SEEKS FINDS"
04:35 "AND TO HIM WHO KNOCKS IT WILL BE OPENED." 04:38 SOMEONE CAN GO..."YEAH THAT'S WHAT I'M TALKIN ABOUT..."
04:41 "I CAN USE SOME RELIGION LIKE THAT." 04:44 "HERE I AM DOWN HERE ALL MESSED UP"
04:46 "AND GOD'S WILLING TO SHOW UP." 04:49 WELL FOR YOU I'VE GOT SOME GOOD NEWS AND SOME BAD NEWS. 04:54 THE GOOD NEWS IS HE MEANS WHAT HE SAYS AND HE DOES SHOW UP. 04:58 HE WILL SHOW UP. 05:00 THAT'S THE GOOD NEWS. 05:07 AS MUCH AS IT'S ABOUT WHAT HE WANTS US TO DO. 05:15 HE SAYS "YEAH, GOD'S GOING TO HOOK YOU UP,"
05:19 REALIZING THAT... WHAT SORT OF MEN AND WOMEN OUGHT WE TO BE? 05:45 OR "THE TEACHING", "AND THE PROPHETS",THE "NEVI'IM". 06:06 HE WANTS US TO DO UNTO OTHERS THE WAY THAT WE WOULD HAVE GOD TO DO UNTO US. 06:19 "WHATEVER YOU WANT MEN TO DO TO YOU DO ALSO TO THEM"? 06:32 AND YOU'LL SEE THE LORD COMING THROUGH FOR YOU IN WAYS YOU CAN ONLY IMAGINE. 06:54 IT'S A NARROW, PRECARIOUS PATHWAY. 07:01 WHILE OTHERS HAD NOT. 07:11 BUT THE GOAL IS WORTH THE PRIZE. 07:22 AND THE KINGDOM OF HEAVEN. 07:31 AND JESUS SAID "ENTER BY THE NARROW WAY,"
07:35 "THE WAY THAT LEADS TO LIFE". 07:39 HE SPOKE OF THE OTHER WAY AS A WAY THAT LEADS TO DEATH. 07:49 THAT PEOPLE CAN LEAD THEMSELVES TO RUIN VERY EASILY. 07:59 AND THOSE THAT MAKE THEIR WAY TO IT ARE FEW. 08:08 IT'S RATHER NATURAL AT ONE LEVEL. 08:20 COULD JUST BRING YOU DOWN. 08:34 AND BRING YOURSELF INTO RUIN THAT WAY. 08:50 AND THAT BROAD WAY. 08:54 AND HE SAID "ENTER BY THE NARROW GATE"
08:58 "FOR WIDE IS THE GATE AND BROAD IS THE WAY THAT LEADS TO DESTRUCTION"
09:02 "AND THERE ARE MANY WHO GO IN BY IT." 09:06 THE PATHWAY TO HELL IS THE HIGHWAY TO HELL. 09:11 "NARROW IS THE GATE AND DIFFICULT IS THE WAY WHICH LEADS TO LIFE"
09:15 "AND THERE ARE PRECIOUS FEW WHO FIND IT." 09:25 THIS SOUNDS VERY CHALLENGING TO ME. 09:35 RABBINIC THEOLOGY SPEAKS OF "HALAKHA"
09:39 WHICH IS THE TORAH OBSERVANT WAY TO WALK FOR OBSERVANT JEWS. 09:50 IT'S A VERB WHICH MEANS "TO WALK". 09:52 THE JOURNEY WITH GOD IS CALLED A WALK. 09:56 THE LORD BECKONED ABRAHAM TO WALK WITH HIM. 10:06 DELIBERATELY GOING DOWN A PATH WITH THE MAKER. 10:13 TO BE THUS ORIENTED. 10:24 IT'S EASY BY NATURE JUST TO BE LED AWAY FROM GOD. 10:29 I BELIEVE IT'S JOB WHO SAYS THAT MAN IS INCLINED TOWARDS SINS JUST LIKE THE SPARKS FLY UPWARD. 10:35 THE NATURAL INCLINATION OF THINGS IS TO GO AWRY. 10:49 AND THEY'RE NOT THINKING GOOD. 10:50 PEOPLE'S EYES CAN LEAD THEM ASTRAY OFF THE PATH. 11:00 AND DESTROY THEMSELVES AND OTHER PEOPLE AROUND THEM IN THE PROCESS. 11:08 BUT JESUS BECKONS DISCIPLES TO BE DISCIPLINED. 11:12 HE SAID, "NARROW IS THE WAY THAT LEADS TO LIFE"
11:19 OR FIRST METHODIST CHURCH, OR FIRST ASSEMBLIES OF GOD CHURCH. 11:26 BUT IT'S THE WAY OF LIFE THAT'S LIVED OUTSIDE OF THE CHURCH. 11:41 THEIR ANGERS, WHAT TO DO WITH THE MONEY, WHAT TO DO VARIOUS ENERGIES, ETC. 11:46 IT'S ALL THERE IN THE SERMON. 11:51 AND YOUR LIFE WILL BE BETTER BY VIRTUE OF YOUR SO DOING. 12:00 ASK FOR OUR FREE MONTHLY NEWS LETTER "THE LEVITT LETTER". 12:04 WHEN YOU CALL BE SURE TO ASK FOR OUR FREE CATALOGUE WITH THE LATEST VIDEOS, BOOKS, AND MUSIC. 12:13 READING PACKETS, TEACHINGS CDs, AND MAIL-IN TESTS. 12:21 OR CRUISE THE MEDITERRANEAN VISITING GREECE AND EPHESUS. 12:34 FOR THEY WERE FISHERMEN. 12:39 AS DO THE FISHERMEN LIKE DANIEL CARMEL. 12:48 ON THE SEA OF GALILEE WORSHIP BOATS. 12:51 JOIN US IN WORSHIP ON THE GALILEE. 13:04 TO KNOW SOMETHING IS TO EXPERIENCE SOMETHING. 13:18 AND WOULD THAT YOU REALLY EXPERIENCED THE BLESSING THAT IS ISRAEL. 13:24 OH MY WORD, PEOPLE ARE TRANSFORMED. 13:27 THAT'S WHY PEOPLE HAVE BEEN GOING FOR THOUSANDS OF YEARS. 13:39 AND WE'LL SEND YOU A BROCHURE. 13:50 YOU MIGHT WANT TO TAKE US UP ON THE OFFER FOR TODAY. 13:55 "JESUS, THE JEW'S JEW". 14:03 BUT THAT'S MORE THEIR OWN PREJUDICE. 14:05 JESUS WAS THE WORLD'S GREATEST JEW. 14:10 AND ZOLA WEIGHS IN ON IT IN BOOK FORM AND WITH THE CD AS WELL. 14:14 THERE'S MORE ON THAT TO COME. 14:20 IT'S YOURS FOR THE ASKING. 14:22 OR GO TO WWW.LEVITT.COM AND PICK IT UP. 14:29 LET'S HEAR MORE ABOUT JESUS. 15:28 JESUS SAYING THAT "YOU'LL KNOW THEM BY THEIR FRUITS"
15:39 AND THAT IS THAT THERE'S A LOT OF PRETENSE GOING AROUND. 15:53 "BUT THE TRUTH IS, IS THAT I REALLY DON'T KNOW YOU." 15:59 BUT IT'S REALLY NOT THERE. 16:16 BUT THE TRUTH BE KNOWN IT'S MORE SHALLOW THAN SUBSTANCE. 16:24 "YOU'LL KNOW THEM BY THEIR FRUITS". 16:30 YOU'LL KNOW THEM BY THEIR 'TOOTS'. 16:38 BUT THEY REALLY DON'T WALK THE WALK. 16:49 "YOU'LL KNOW THEM BY THEIR FRUITS"? 17:15 NOT JUST ONE'S OWN. 17:23 WHICH IS THE KIND OF LIFE THAT THE LORD'S LOOKING FOR. 17:40 "THEY PROFESS ME WITH THEIR LIPS"
17:42 "BUT THEIR HEARTS ARE FAR FROM ME". 17:53 AND WE'LL CONSIDER MORE DELIBERATELY WHAT HE HAS TO SAY. 17:59 "BEWARE OF FALSE PROPHETS WHO COME TO YOU IN SHEEP'S CLOTHING"
18:05 "BUT INWARDLY ARE RAVENOUS WOLVES." 18:13 THEY'RE BENT ON DEVOURING US. 18:15 AND HAVE YOU EVER MET SUCH PEOPLE? 18:18 I HAVE AND IT'S NOT PLEASANT. 18:26 "LISTEN, YOU'LL KNOW THEM BY THEIR FRUITS." 18:31 "YOU'LL KNOW THEM BY THEIR FRUITS"
18:38 "THEREFORE BY THEIR FRUITS YOU WILL KNOW THEM." 18:44 AND THAT CAUSES ME TO BELIEVE THAT HE'S SERIOUS ABOUT IT. 18:51 US BEARING THE KIND OF FRUITS IN OUR LIFE AND TEMPERAMENT. 19:05 KNOW AS WELL THAT FRUIT DOESN'T ALWAYS APPEAR RIGHT AWAY. 19:14 AND LOOK FOR THE FRUITS OF MY LABOR. 19:20 TO THE RIGHT KIND OF MANIFESTATION. 19:27 AS A RESULT OF OUR SO DOING. 22:26 IT JUST THROWS THEM ON THE DEFENSIVE. 22:34 AND LET THE LORD THE MORE SO TAKE THE OFFENSE. 22:49 AND COMPLYING WITH HIS WILL. 23:11 TO PICK UP WITH JESUS' WILL AND WAYS. 23:17 AND HE'S GOING TO TALK ABOUT THAT AS WE GO TO HIM NOW. 23:23 "THY WILL BE DONE" IS THE NEXT PHRASE. 23:32 AND SAID "NOT MY WILL BUT THINE BE DONE". 23:42 THE SPIRITUAL STRENGTH FOR OUR OWN WILDERNESS JOURNEY. 23:54 "AND FORGIVE US OUR DEBTS". 23:58 UNBELIEVERS DON'T KNOW THEY'RE IN DEBT TO GOD. 24:08 HE'S JUST AND MERCIFUL TO FORGIVE US. 24:10 FORGIVENESS IS MANDATORY IN THE KINGDOM. 24:20 IT'S AN HONEST HEART PLEA BY THOSE CONSCIENCE OF THE SINS AND THEIR WEAKNESSES. 24:26 "THE KINGDOM, THE POWER, THE GLORY" SPEAKS FOR ITSELF. 24:41 MATTHEW CHAPTER 5 TO CHAPTER 7. 24:43 KNOW THE NEW LAW. 24:46 ZOLA TALKED ABOUT BEING A GOOD CITIZEN OF THE LORD'S KINGDOM. 24:52 LET'S EXPLORE WHAT THAT MIGHT MEAN A LITTLE BIT. 25:12 I THINK OF LOOKING TO DWELL PEACEABLY WITH OTHERS. 25:16 THAT'S WHAT I THINK OF WHEN I THINK OF KINGDOM PRINCIPALLY. 25:23 AND THEN THERE'S THE KINGDOM OF OUR LORD AND OF HIS CHRIST. 25:28 WHAT DOES IT MEAN TO BE A GOOD CITIZEN IN THAT? 25:36 BECAUSE THERE'S A LOT OF BAD CITIZENSHIP GOING ON. 25:53 I THINK WE DO WELL TO LOOK TO BE GOOD CITIZENS. 26:16 BUT IF WE LOSE IT WE'LL FIND IT. 26:30 ARE GOING TO BE ENHANCED AND EXPANDED ON PLANET EARTH. 26:33 I HOPE YOU'RE LEARNING ABOUT GOD'S KINGDOM. 26:36 THANK YOU FOR ALLOWING ME INTO YOUR LIVING ROOM, HEADS AND HEARTS. 26:39 COME WITH US ON THE JOURNEY NEXT WEEK.